Q. What were some early lessons for you? A. I was fortunate to have two incredible parents. My mother was probably the kindest, sweetest person to ever walk the earth and devoted her life to helping others. My father was brilliant, kind and warm. His family was very poor, and he lost his mother when he was 8, so he began working at that age, whatever he could do, to support his three younger siblings and put food on the table. He was very much a self-made man, and he became quite successful. He just had this extraordinarily positive attitude about life. 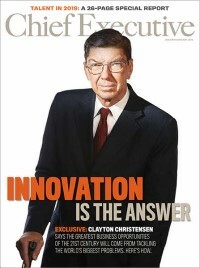 He had many inventions and patents and built successful businesses. So I grew up in this very entrepreneurial setting. Conversations around the kitchen table often included figuring out margins and price points. He also talked about the importance of not depending on anyone else for your livelihood. You want to be the person who signs the paycheck, not the one who’s waiting to see if you’ll get one.